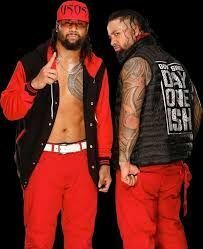 Interesting trivia: Jey and Jimmy are members of the Anoaʻi family which also includes Roman Reigns, The Rock, Umaga and Yokozuna. They are the sons of Hall of Famer Rikishi. The brothers started out in FCW in late 2009. They even went on to win the FCW Tag Team Championships during their stint at the developmental territory. The Uso Brothers made their debut on WWE TV on the May 24, 2010 episode of Raw when they attacked then-Tag Team Champions: The Hart Dynasty. Managed by Tamina, the trio made their PPV debut against The Hart Dynasty (Tyson Kidd, DH Smith and Natalya) at Fatal 4-Way where they lost. The Usos continued to feud with the Hart Dynasty throughout the year but remained unsuccessful in capturing the Tag Team Championships. They were drafted to Smackdown soon after and turned face, feuding with The Core. The Usos failed to achieve success from 2011-2013 as they could not win the Tag Team Championships even after numerous shots. In order to pay homage to their uncle Umaga and as a tribute to their Samoan culture, the brothers started using face paint from 2013. On the March 3 episode of Raw, The Usos were finally successful in Capturing their first Tag Team Championships against the Outlaws. The brothers held on to the titles for 202 days before dropping them to Cody Rhodes and Goldust at the Night Of Champions PPV. The Usos won the 2014 Tag Team of the Year Slammy Award. On the December 29 edition of Raw, The Usos won their second tag team Championships by defeating The Miz and Damien Sandow and continued to feud with them and Goldust & Cosy, retaining their Championships on multiple occasions. However, they lost their belts to Tyson Kidd and Cesaro at the Fastlane PPV in late February. Due to Jey Uso suffering an anterior shoulder dislocation on the left arm in April, the Usos disbanded for a while but returned to action in November. They were paired with Roman Reigns and feuded with the New Day, Dudley Boys and Social Outcasts for brief periods of time. On July 19, at the 2016 WWE draft, The Usos were drafted to SmackDown. The Usos turned heel after they viciously attacked American Alpha (Chad Gable and Jason Jordan) soon after the American Alpha defeated them in less than a minute. Although managing to become the #1 Contenders, the Usos were unable to dethrone then Smackdown Tag Champions Rhyno and Slater on multiple occasions. During December, the duo adopted a new gimmick where they acted like street thugs. In Mid-march The Usos went on to finally defeat the American Alpha for the Smackdown Tag Titles thus becoming the first team to hold both RAW and SmackDown Tag Titles. At Battleground, they lost the tag titles to New Day, ending their 124-day reign and it also began a long-term feud between the two teams which revolutionised the Tag Team Division. On August 20 at the SummerSlam pre-show, The Usos defeated The New Day to recapture the titles, making them the first team to win the SmackDown Tag Team Championship twice. They lost the Championships to New Day yet again in an episode of Smackdown when the two teams faced off in a street fight. In a rematch that took place inside Hell in a Cell, The Usos managed to pick up the win and regain their tag team titles. The Usos turned face yet again when they offered a truce with the New Day after their spectacular HIAC Match. At Survivor Series, they picked up a win against Raw Tag Team Champions Cesaro and Sheamus in an interbrand Champion vs Champion match. The Usos then had a feud with Chad Gable and Shelton Benjamin which came to an end after the brothers defeated Gable and Benjamin in a 2-out of-3 falls match at Royal Rumble. WWE RAW: 5 Surprises that could happen- Title Change, Sister Abigail debuts?